More than 5,400km. Almost 80 hours in total. Four time zones and 11 states. One exhausted but also exhilarated traveller. A solo trans-America rail trip, bookended by the Golden Gate Bridge in San Francisco and the Statue of Liberty in New York City, has been on my bucket list for years. For a train lover like me, this is the perfect way to visit friends and family scattered across the United States, including in San Francisco, Denver and Brooklyn. My route cuts a swathe right through the heartland of America and trundles across much of the Midwest. Time and distance do not faze me one bit. Neither do the solitude and the lack of shower facilities. While flying from San Francisco - my starting point on the West coast - to New York City in the East will take less than six hours, it is precisely the opportunity to stretch out the trip over several days that draws me. It is a chance to meander, to truly see the Land of the Free, and to focus on the journey, not the destination. 1. On the dot at 9.10am daily, the California Zephyr pulls out from the unassuming station at Emeryville, outside San Francisco. The train, which goes all the way to Chicago, the mid-point of my journey, soon leaves the suburbs behind and I see the waters of San Pablo Bay almost lapping at the tracks. Soon, the rhythmic motion of the train lulls me into a catnap, the first of many pleasurable ones. 2. Unexpectedly, the sea view speedily changes to a winter wonderland scene, as the train chugs up the Sierra Nevada. Known as the "snow-capped mountain range" by early Spanish settlers, certain peaks are covered in snow even in summer. As snow flurries swirl and drift in silence outside the glass, I cannot shake the feeling that I'm gazing upon a life-sized snow globe. 3. A couple of hours later, the "screensaver" outside morphs from snowscape to desert vista as we approach the arid land outside Reno, Nevada. The landscape looks barely hospitable and I'm glad to be cocooned in the air-conditioned carriage, safe from the great desert heat. Another 4,651km more to go, but who's counting? 4. The sun blazes like a fireball in the sky as it sets over the Forty-Mile Desert. In the mid-1800s, this was the most dangerous section of the California Emigrant Trail, where men and animals died at every mile while attempting to cross it. For the modern-day traveller, it is also possibly the most treacherous part of the train route. Here, phone signals and Wi-Fi peter out, forcing passengers to survive without Facebook. 5. A rousing "Good morning! Good morning! Good morning!" booms over the train's PA system on the second day of the trip. As I wake up, I find myself gazing out at the majestic Book Cliffs, which truly look like giant tomes on a 300km-long shelf stretching from western Colorado to eastern Utah. This desolate landscape has remained largely unchanged since the days of the Wild West. Through the window, I spy a motorbike speeding silently along the empty road, churning up a cloud of dust. I squint and can almost believe it is a cowboy on horseback or the Lone Ranger galloping to the rescue. 6. 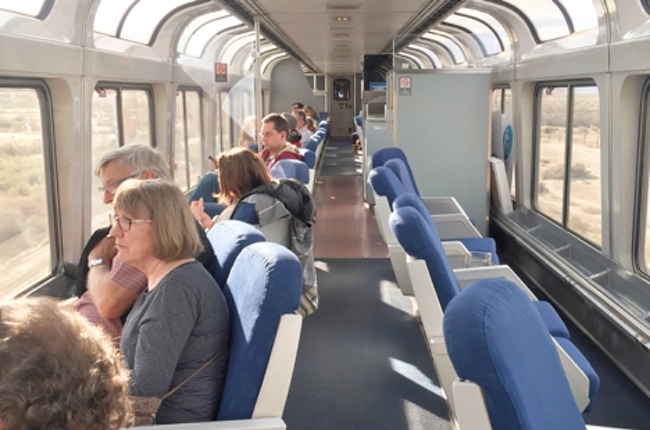 Running on one of the most scenic routes in North America, the California Zephyr has a Sightseer Lounge, a carriage gleaming with windows that let in sunlight and panoramic views. This is the favourite spot of passengers, who plonk themselves down to soak in the sights, which are way more spectacular than what you get at 30,000 ft through a tiny oval pane on a plane. Not only do I get a front-row seat to Mother Nature, I also catch glimpses of the glittering casinos of Reno, the skyscrapers of Chicago and remote towns with names like Truckee, Winnemucca and Ottumwa. 7. Among the mostly American passengers are a handful of Amish people, devout Protestants who dress plainly and follow simple customs. You will never spot them on planes, as they eschew modern technology and do not fly or drive, but riding the train is permitted. In the dining car, I get the chance to chat with a rice farmer from northern California, a retired rancher from Montana, a couple of laidback snowboarders heading to Denver and a chatty mother-daughter duo from the casinos in Reno - everyday Americans I would never have had the chance to share a meal with if not for the fact we have to share a dining booth. 8. In Chicago, I change to the Lake Shore Limited. Although this route does not bestow jaw-dropping views, I do see more of the country than the average American, as one of my dinner companions informs me almost enviously. In 20 hours, I trundle through five states - Illinois, Indiana, Ohio, Pennsylvania and New York. On its last leg, the train snakes along the Hudson River towards New York's Penn Station. I have climbed mountains, crossed rivers and traversed deserts on my epic journey and - finally - I have arrived. Singapore Airlines (www.singaporeair.com) and United (www.united.com) have non-stop daily flights from Singapore to San Francisco. From the San Francisco Transbay Temporary Terminal, which is near the financial district, a coach takes travellers to the Emeryville train station outside the city, where the train journey begins. The coach takes about half an hour and is included when you book the train ticket from San Francisco. The Amtrak website (www.amtrak.com) has a straightforward booking system. Sleeping compartments range from coffin-sized roomettes to suites for four adults and include meals in the dining car. Coach seats, which do not include food, recline more comfortably than the average economy seat on planes. A coach seat will set you back by about US$300 (S$405), while sleeping compartments will cost two to three times more. Choose to travel on weekdays, as weekends see more passengers, and hence your chances of bagging a coveted window seat will be slimmer. Seating is on a first-come, first-served basis for coach passengers and also in the Sightseer Lounge - a carriage with extra-large windows for great views. There are shower facilities on board, but they are for sleeper passengers. If you intend to travel in coach, break up your journey in Denver and Chicago, as I did, so you can stay in a hotel for a much-needed shower. The dining car serves all-American fare, including scrambled eggs (US$8.50) for breakfast and steak (US$25) for dinner. Be prepared to make small talk if you are travelling solo, as diners are seated in groups of four. There is also a snack bar with frozen pizza, cup noodles, chocolate bars and beverages. Pack a small stash of snacks, 3-in-1 coffee and instant noodles to avoid paying marked-up prices on board. Ask at the dining car or snack bar for hot water. I had a thermos flask, which came in very handy. To take photos through the windows without distracting reflections, press the lens of your camera or phone squarely against the glass. As the scenery is constantly changing, be trigger happy and take multiple shots (try the sport or burst mode), as some inevitably will turn out blurry due to the train's motion. Avoid using flash as it creates unwanted reflections. To get sweeping views of the train as it rounds a bend, it helps to pick a seat near the rear. And for the best photos, a window seat is obviously a must.